But it’s coming along. If you click on the image, you will go to Flickr where you can see my notes about recently added details. Now the question is: how shall I finish this block? Does it need a border? Should I frame it? What shall I do with it? 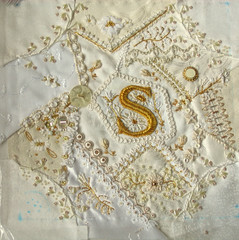 Here’s a close-up of her sampler. I used bright check sadi, the faceted kind, in this seam treatment. The sadi threads are the gold bars. 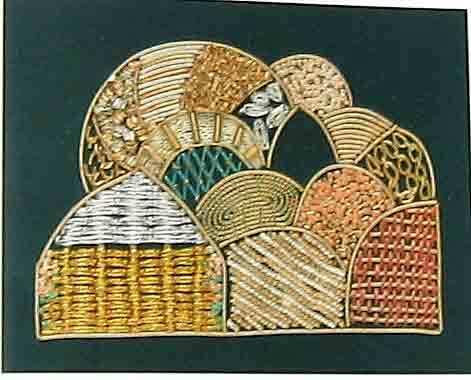 Sadi is much like the gold threads used in English and European goldwork, but it is not as fine, a little heavier and therefore a bit easier to work with. Judging by the comparative costs, I doubt that sadi has any real gold content, unlike English metal threads. Here’s a close-up of the Case Western Reserve University, where Matt is now a rising senior, that I used as the central motif, worked in sadi smooth and bright check over string and felt padding. 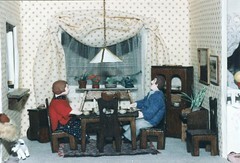 The detached chain stitches in the matrix are fine smooth sadi centered with a red cross stitch to represent the influence of his Friends High School. I’m making progress on my S block, but now I’m reluctant to show it, so near completion. I hope! I’ve really struggled with this piece, and I’m about to unstitch part of a motif I’m not satisfied with. You may remember this sadi S I did for practice. Just one of any number of details I’ve done more than once. 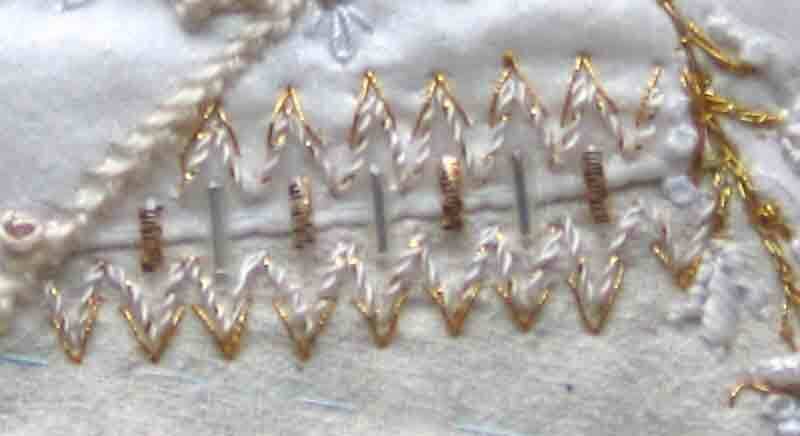 This seam treatment features lace and beads. At the bottom there are tiny pearl seed beads. At the top are beads covered with rayon thread. 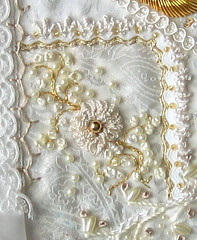 In the middle, I stitched rayon ribbon thread over the lace and as colonial knots. Ah, yes, there are Cretan stitches, too. You’ve seen the motif on this patch. Today I’m showing you its seam treatment. This seam began with a row of tiny rick rack, on which I added glass beads. Not enough. Next I added bullions in Eterna silk twist #5. Under the rick rack I couched Japanese gold twist, DMC perle #8, and a row of Kreinik metallic fine braid. What with sickness and catching up after sickness and unstitching bits I was not satisfied with, I have not made much progress on my S block. 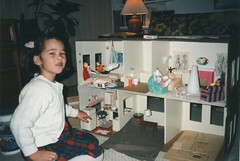 So, instead, I will show you something I did before I got into needlework. 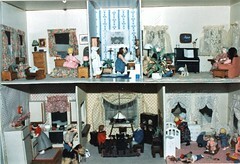 It wasn’t long, though, before I got hooked and began making more sophisticated (relatively speaking) furnishings and figures for the house. As Michelle’s visits were infrequent, it became my project, instead of ours. When it was finished, I presented it to her. 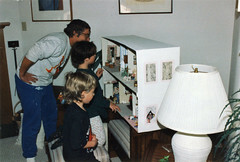 Here she is with her dad and her brother Luke, about whom some of you have read. This picture must have been taken 14 years ago. Next the dining room. I had so much fun making all the house plants. 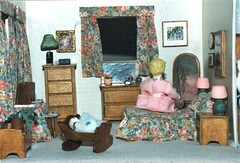 Here’s the nursery, with grandma putting baby to bed with a bottle. Upstairs there’s a bedroom, and, oh my goodness, there’s a NEW baby! Well, let’s hope one of the babies is just visiting. Next door is the bathroom. 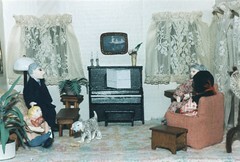 Its wallpaper was once my flannel nightgown. In the living room, the picture over the piano is a reduction of an actual Mary Cassatt print. The carpeting was once a place-mat. That’s a kitten the little boy’s holding. 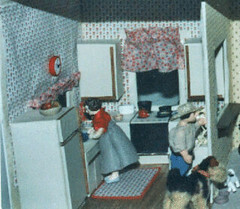 I’ve never had pets, but Michelle and Luke had cats and dogs, so I had to put some in the dolls’ house. They could even celebrate Christmas at Michelle’s house. It was such fun decorating the tree and wrapping gifts, especially as that was the only way I could celebrate Christmas at that stage of my illness. It’s only taken me most of today to get this post up. First, editing the pictures which had to be scanned into the computer. 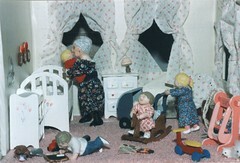 Then finding out through several trials, that Word Press would not upload my saved-for-web pictures. 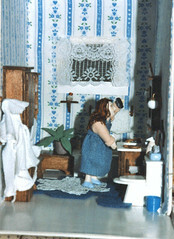 Uploading the pictures to Flickr, then transferring them, one at a time, to my blog. Then copying the individual pictures and pasting them into one post. What a way to spend the day! I could have been stitching! 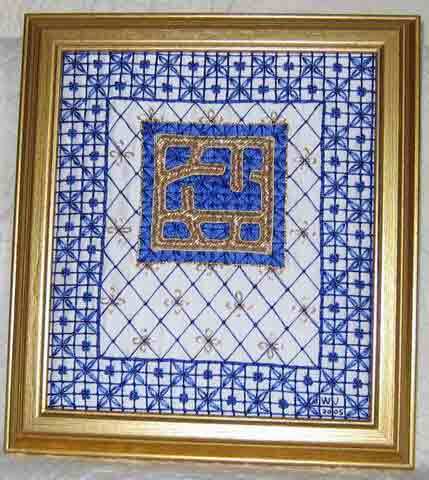 This week I’ve met Megan from Australia who has a blog about calligraphy, illumination, and historical embroidery. Do go visit her. 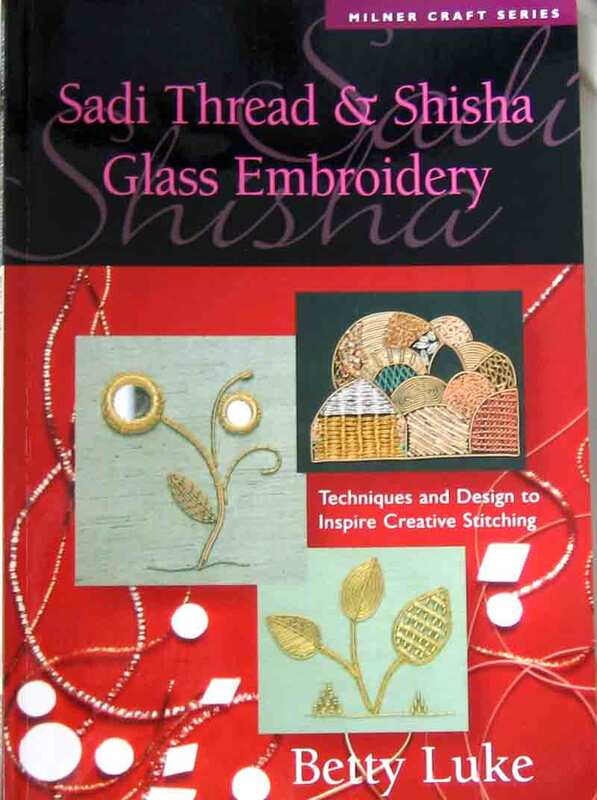 She features a wealth of resources, having done a lot of research and stitching of her own. Especially don’t miss her book cover posts. 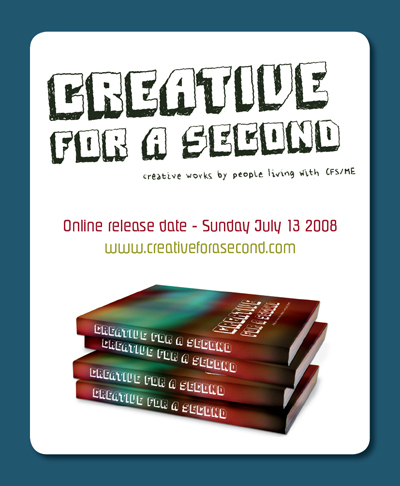 Yesterday the book, Creative for a Second, was released online . Conceived, compiled, edited, and designed by Kirrily Anderson, it is a collection of art, both written and visual, created by people with ME-CFS, people who often can not do anything. Each contributor has included a statement about what creativity means in his or her life. Kirrily herself has had ME-CFS for several years. That she could create such a work is a wonder. You can see the whole book here. By clicking on the pages, you can enlarge them. It is beautifully designed, with many moving works of art. And you can see my contribution on page 29. It’s funny, as this was just a practice piece, never intended to be a finished work. 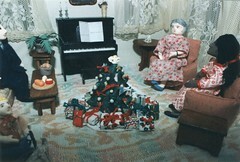 However, I was unable to get a large enough photograph of any other work that could be used in the book. The book is also being published in print.